Last month, in towns around the Big Bay area of Michigan’s Upper Peninsula, global mining giant Rio Tinto held the second in its series of “community scorecard” forums. At these events, people from the communities around Rio Tinto’s Kennecott Eagle Mine project are asked to score the company on its performance in five areas: environmental performance, local hiring, safety, transparency and communication, and, finally, something the company calls “leaving more wood on the woodpile,” which is supposed to be a folksy way of talking about the company’s contributions to the development of the region. Rio Tinto prides itself on these forums: “to our knowledge no other mining company has introduced a tool that allows the community to regularly rate their performance, which is then made public. We hope with the Eagle Mine Community Scorecard the UP continues to set new benchmarks in how modern mining works with communities.” But after reading a few accounts of the forums and watching some video clips of the meetings included on Keweenaw Now, a local blog, all I see is a lost opportunity. Turnout at these forums has been low — about fifty people showed up for the biggest forum in Marquette, and most of them were Rio Tinto employees — so the scorecard results, which the company touts as proof of social license, will hardly stand close scrutiny. “It’s a global mining corporation’s idea of democracy,” remarked Kathleen Heideman of Save the Wild UP. “First they show slides about how great they are — then we should click to indicate our agreement. That’s meaningless.” Even when the company allowed questions and comments before the scoring period at a May 15th meeting in L’Anse, the meeting could hardly be described as an authentic community forum. Rio Tinto may think that with these forums it’s doing something entirely new, but in reality the company is making a lot of old mistakes. If these community forums are going to be anything more than a public relations exercise with predetermined outcomes, the current design of the forum needs to be scrapped and they need to be radically reconceived. Voices from the communities around the Eagle Mine need to be heard and heeded — to use a phrase I’ve used elsewhere (e.g., here and here) to talk about what real listening takes — and the power dynamic in these forums needs to shift. Otherwise, I don’t see much chance of the forums making the slightest difference in how the mining company operates, how it contributes to the development of the region, and whether it can ever enjoy social license to operate in the UP. Those are all things Rio Tinto claims it cares about. In the video clips posted on Keweenaw Now, you can see how things went. Put aside, for the moment, the content of the discussion (which, despite the company’s attempt to kill the discussion by PowerPoint, is rich and provocative — a real tribute to the local citizens who did their homework and turned out for the meeting). You don’t have to know anything about the situation in the Upper Peninsula to sense that things are amiss. Focus on just one very telling detail in the video clips: who’s holding the microphone? At Rio Tinto Community Scorecard forums, the Rio Tinto people stand at the front of the room and speak into microphones. Nobody else does. This may seem like a small detail. There are, after all, big things at stake — the integrity of the environment around Big Bay and the Salmon Trout River, the economic future of the Upper Peninsula as well as the future of life on Lake Superior. Rio Tinto’s Eagle mine opens the first phase of one of the biggest mining operations in the world — which is about to be staged around one of the biggest freshwater lakes in the world. This is a critical turning point. All around Lake Superior, things are going to change: things are already changing. Surely it can’t matter who’s standing where and whether they are holding a microphone? Here’s a typical clip, where Jeffery Loman of the Keweenaw Bay Indian Community asks Rio Tinto’s Matt Johnson about the permitting process for discharging mining effluent into groundwater and surface water. Johnson stands in front of his PowerPoint slides, holding the microphone as Loman, seated with the others in attendance, tries to engage him. At around 2:40 in the clip, when Johnson feels that the question is too technical for him to answer, he hands off to Kristen Mariuzza, Rio Tinto Eagle Project Environmental and Permitting Manager. And what does Mariuzza do? She marches to the front of the room and takes the microphone. Mariuzza probably does this thinking that it’s the only way everybody in the room can hear her, or she’s so accustomed to presenting in a Rio Tinto corporate setting that she doesn’t know how to drop the act in other settings. Everyone can obviously hear Loman, who remains seated and addresses Johnson and Mariuzza in a normal tone of voice. It’s curious, isn’t it? Johnson and Mariuzza seem to be the only people in the room who require a microphone in order to speak and to be heard. Why do their voices need to be amplified above all others? That is, after all, what microphones do: they amplify one voice so that others are relegated to the background, or drowned out altogether. So both Johnson and Mariuzza are speaking over the community, and (I don’t choose this word lightly) dominating the discussion. The microphone sets the power dynamic of the situation. Some of us are old enough to remember those corny Popeil TV commercials for a product called Mr. Microphone. The commercial runs through a number of different scenarios in which people use this amazing product to amplify their voices — transmitting it to a radio and broadcasting it for all to hear. Essentially each scenario is the same: everyone finds Mr. Microphone amazing, but everyone is most amazed at the magical sound of his or her own voice coming through the radio. People around them laugh and notice, but the astonishment, the surprise, the wonder at Mr. Microphone is a deeply narcissistic pleasure. Something like that is happening here, to a lesser degree but with graver consequences. The people from Rio Tinto are amplifying — and most likely hearing — only their own voices, not the voices of others, and they are, I’d venture, deriving from that experience a false sense of satisfaction at having engaged with the local community. What could they be doing instead? For starters, I would suggest they ditch the microphones, so that no one’s voice is amplified over all others. This won’t solve the problems being discussed, but it will increase the chances for voices from around the community to be heard. If people seated in the back of the room can’t hear what’s being said, then it can be repeated for their benefit: there’s value in repetition, as it gives everyone in the room a chance to assess again what’s being said and agree that someone’s view is being accurately communicated. Efficiency is not a virtue of real conversation. If the Rio Tinto people are not standing at the front of the room holding a microphone, what will they do? Sit down — and not at the front of the room, where they are sure to command attention and where everyone must ultimately direct their remarks. There is no good reason not to sit in the same chairs that are comfortably accommodating the people with whom one is meeting. Again, this sounds like a minor adjustment, almost a point of etiquette, but I have seen this work wonders in classrooms deliberately designed so there is no front of the room, in corporate as well as academic settings. This way, anyone in the room can lead the conversation at any given time. Now the room is starting to look like a face-to-face meeting — with everyone’s face at the same level and everyone seated at roughly the same distance from each other. Let’s not pretend for a moment that this will somehow put Rio Tinto on equal footing with the citizens in the room. Johnson and Mariuzza represent a multi-billion dollar global mining company with tremendous power and enormous reach in the Michigan legislature and beyond, to the highest levels of national government. In fact, Matt Johnson himself came out of Governor Jennifer Granholm’s administration to work for Rio Tinto as its local front man on the Kennecott project; Mariuzza also walked through a revolving door, out of government and into Rio Tinto. So there is a huge power disparity in the room — one that a simple conversation like this cannot bridge. But at least with these and other changes there might be a chance at conversation. Relinquish control. A credible, independent third party, someone who isn’t in Rio Tinto’s employ, should moderate and facilitate the conversation. Right now the flow of the conversation is controlled by the man with the microphone. A facilitator can help the whole group focus on issues, clarify what’s being said and ensure that people in the room are being heard. Map the conversation. It looks as if right now there’s no way to capture what’s being said in the room and ensure that everybody agrees on what was said and that their point of view is being adequately represented. Video cameras record, but they also capture one point of view. Some sheets of white paper or a whiteboard would allow one person to track the conversation, and make it possible for anyone to stand up and edit, on the spot, what’s on them. No more dog and pony. The PowerPoint show should be left where it belongs — back at the corporate office. It is a way to control the narrative, discouraging conversation, other points of view and other stories. If diagrams or maps are required for the conversation, then anyone in the room should be able to control the slideshow — and anyone in the room should be able to introduce slides. These Community Scorecard forums may ultimately succeed or continue to fail, but people living around the Eagle Mine don’t need microphones or PowerPoint slides or corporate sponsors to talk about what’s happening in their communities. Towns and townships in the Upper Peninsula and communities all around Lake Superior may not have the clout of Rio Tinto or any of the other mining companies, but they have each other — and there’s great power in that, or at least there can be, no matter how much wood Rio Tinto leaves or does not leave on the woodpile. This entry was posted in Business and Society, Governance, Human Rights, Language, Louis V. Galdieri's Blog, The Power of Asking and tagged asking, authority, community, community scorecard forums, conversation, corporate power, dialogue, extractive industry, Jeffery Loman, Kathleen Heideman, Keweenaw Bay Indian Community, Keweenaw Now, Keweenaw Peninsula, Lake Superior, listening, Matt Johnson, Michigan, mining, Mr. Microphone, non-coercion, non-coercive power, power, PowerPoint, presenting, RioTinto, Save the Wild UP, social license, stakeholder dialogue, the power of asking, Upper Peninsula, Water on June 4, 2013 by lvgaldieri. “This is something that we had anticipated,” said Rio Tinto-Kennecott spokesman Kyle Bennett, when asked about the huge landslide that shut down the Bingham Canyon Mine last week. Still, the enormity of the slide took Ted Himebaugh, Kennecott’s general manager of operation readiness, by surprise: he told the Deseret News that “he had seen nothing like it in his 36 years with the company.” A black swan event, then — a wonder. Who could have foreseen this? It’s telling and a little disturbing that the statements the Rio Tinto issued after this disaster (and disaster is the right word here) make no mention of what was going on prior to the slide at Bingham Canyon, which is — it’s hard to believe this needs saying — a whole lot of mining and a whole lot of earth disturbing in close proximity to a geotechnical fault line. 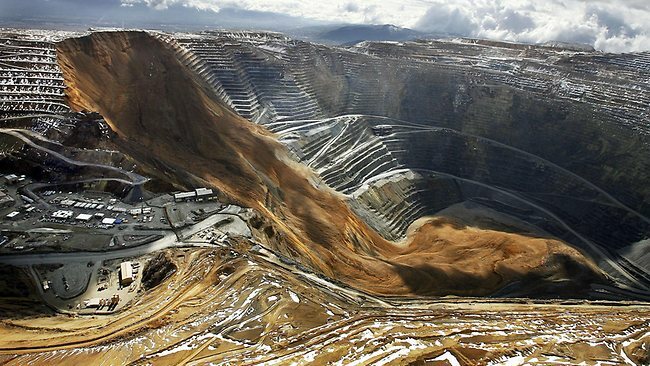 In fact, the Bingham Canyon operation is the world’s largest man-made excavation. I suppose that’s meant to be reassuring. It makes me shudder. What’s missing here is any deeper appreciation of just how risky these industrial mining operations always already are, even when things are running perfectly and according to plan. People concerned about the dangers of subsidence posed by the Eagle Mine operation on the Yellow Dog Watershed (another Rio Tinto /Kennecott project, which I’ve blogged about before — here and here, for instance) might want to have a good look at this Bingham Canyon slide and think about the risks they’re about to run. But it goes beyond — way beyond — the very serious risks of spawning streams collapsing, acid mine drainage, or other kinds of environmental degradation. Industrial mining operations put everything at risk: peace, agriculture, and social stability in many parts of the world, environmental sustainability everywhere mining is done. That doesn’t mean mining shouldn’t be done at all. It means that when it is done, and done at this scale, people, communities, companies and investors need to understand fully how mining will affect them, what it will require of them, what it will involve, what it will bring and what it will leave behind. Company- and industry-sponsored community outreach and corporate responsibility efforts are insufficient; they are created to conceal the real risks and the true costs of mining. “Mining is the material basis for life, making it difficult to exaggerate its significance. George Orwell called it part of the ‘metabolism’ of civilization,” Shefa Siegel writes; and yet “the ethics of mining are nowhere to be found.” His essay is a must-read, especially this week, in the wake of Bingham Canyon and the run up to the Rio Tinto Annual General Meeting. One outcome of mining’s omission from environmental and development ethics is that as other disciplines and sectors gradually integrated concerns about sustainability into their knowledge communities, mining engineering, mineral economics and processing, geochemistry, and other sub-disciplines associated with mining have remained static. As a result, there is less experience with the study and practice of sustainable mining than, say, forestry, agronomy, or soil ecology. There is no mining equivalent, for example, of the Yale School of Forestry & Environmental Studies. And while there is much anxiety about the failure to enact the ethics of climate change or environmental health, mining does not even have an ethical roadmap that we do not follow. With climate change there is broad agreement that exceeding a 2 degree Celsius rise in temperature breaks the planet. Pollution experts know to a microgram the tolerable level of exposure to mercury, lead, and arsenic. But what is expected of a mine? Only in the last decade has vocal public discourse about global resource policy emerged. The effort to build an ethics of sustainable extraction is structured around two principal concepts: transparency and corporate social responsibility. While transparency initiatives concentrate on exposing revenue transactions between the private and public sectors in extractive industry projects, corporate responsibility efforts focus on the improvement of relations between companies and communities. The transparency movement has sparked advocacy and legislative activity in the United States, United Kingdom, and Canada—the host markets for much of the world’s trading of mining shares. Meanwhile, companies are dedicating more staff and resources to ensure the benefits of mine development reach communities in the form of improved services, infrastructure, and education. These twin concepts are intended to transform resource extraction from a winner-takes-all model to one in which all parties benefit. The problem is that neither corporate responsibility nor transparency speaks to the reconciliation of extraction with ecological limits, or to the fact that we have entered a period of resource scarcity that necessitates nothing short of monopolization to make the business of industrial mining profitable. This order of magnitude leaves no room for multiple uses of land and resources, especially the smallholder farming and mining economies upon which people depend in mineralized places. Endemic poverty, conflict, and ecological collapse in these regions are rooted in the inequitable allocation of resources. In such cases, win-win solutions are an illusion. I’ll be live-tweeting the Rio Tinto meeting on Thursday. This entry was posted in Business and Society, Human Rights, Louis V. Galdieri's Blog, Prosperity, Readings and tagged Bingham Canyon, Carnegie Council, copper, copper country, development, development ethics, environment, environmental collapse, environmentalism, ethics, ethics of mining., extractive industry, human rights, Lake Superior, mining, Rio Tinto, Shefa Siegel, Utah, Water, Watershed on April 15, 2013 by lvgaldieri.